Looking for the perfect gift to make that Easter basket stand out? Or want something that will make them giggle? Then look no further because Treat Street has the perfect addition to any Easter basket! 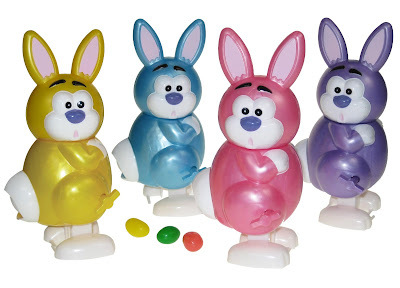 The Funny Bunny is a windup toy that "dispenses" jelly beans! They will definitely make you smile. I was sent the pink Funny Bunny and it is the cutest thing, my daughters and I have played with it so much already. The Funny Bunny comes with a small bag of jelly beans to dispense, but I believe any small jelly bean will work. My daughters and I all agreed that the Funny Bunny is a great little windup toy that is perfect for all ages. So what we're basically saying is to get one! Oh and make sure to check out the entire Treat Street website they carry some other fun toys you won't want to miss. Peeps® - They Make Easter Fun! Mystery Box of Celebrity Driven Goodies! Pierro's Formal Wear for Your Tuxedo Needs! Win a 3 Month Subscription to Conscious Box! $200 Credit to ConcertTickets.com Giveaway!! My Perfect Kindle Fire Giveaway!!! iD Tech Camps - Great for kids 7 to 17!! Wreck-It Ralph DVD Flash Giveaway!! $50 Amazon Gift Code Weekend Flash Giveaway!